This is my mum's octopus salad recipe, this is food I grew up on. I cannot begin to tell you how good this is, I love every single mouthful. 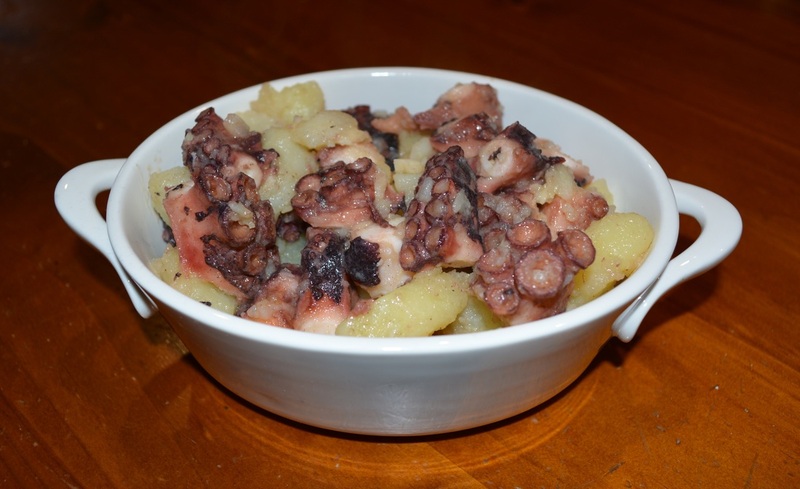 My mum has taught me how to make the most tender octopus, it melts in your mouth, now I am happy to share this with you. The cork was something my grandmother did, my mum still does, so I do also. If you have caught the octopus yourself, it must be frozen before you cook it, not sure why, but if cooked fresh, it will be tough. If purchased from the fish shop you can cook it straight away. The oil quantity is guide, add more or less, that is up to you, taste as you go, and once you feel it tastes great, stop adding oil. I use the large octopus, not the baby octopus here. I do cut off the head and discard, only because I don't like it. My mum would clean out the head, discard the bad bits and cook the head as well. This is something I truly love, simple home cooking at its best. Put the octopus and cork in a large saucepan, add cold water to cover. Bring to the boil, simmer, covered for approximately 20-30 minutes. The octopus is ready when the largest suction cups from the tentacles can be removed with a fork with not too much resistance. Check from 20 minutes onwards. Turn off the heat and leave the octopus in the saucepan for a further 30 minutes. Meanwhile, as soon as the octopus has come to the boil, put the whole potatoes in another saucepan, add cold water to cover. Bring water to the boil, and boil until the potatoes are cooked through, approximately 25-30 minutes, drain. Allow to cool slightly, while you chop up the octopus. Remove octopus from the saucepan, discard the water. Chop up the octopus into bite sized pieces. Return chopped octopus to the saucepan it was cooked in. Peel skins from potatoes while still warm. 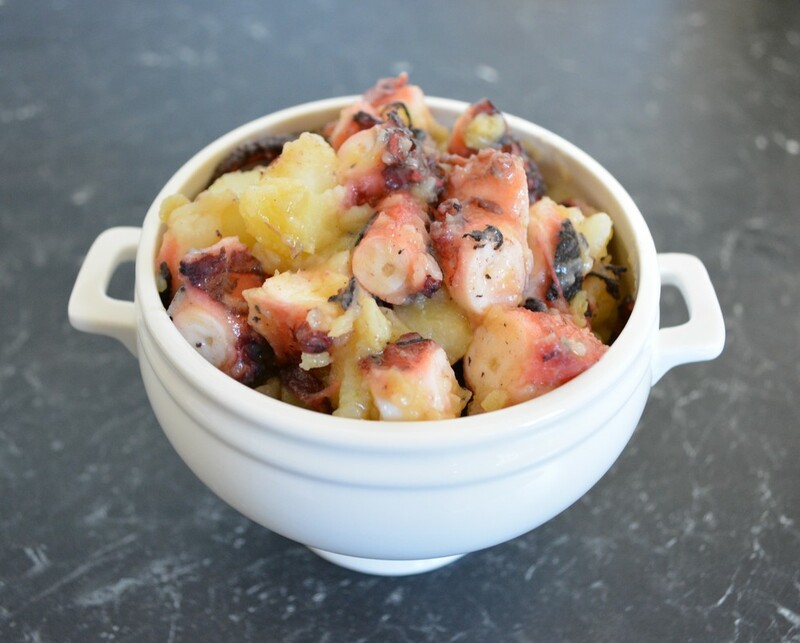 Slice the potatoes and add the potatoes to the octopus along with the garlic. Now season lightly with salt (as the octopus can be salty) and I like to add a lot of white pepper, but you do it to your taste. Now start adding the extra virgin olive oil, add 1/4 cup, give it a stir, taste, keep adding the oil 1/4 cup at a time, until the potato tastes delicious, I actually never measure the oil quantity, it is done by taste. Transfer to a serving bowl, serve immediately.